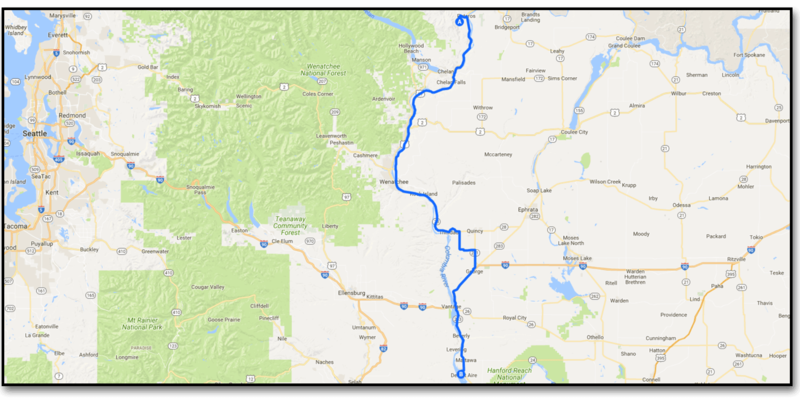 Day eighteen, Alta Lake State Park to Priest Rapids Recreation Area. Well, we are still in Washington on our way to the Zone of Totality to view the solar eclipse on Monday where we have scoped out a campsite in the back-country. Hopefully it isn’t occupied by the alt-right! The country in est-central Washington is bleak, rugged and beautiful as you can see from the posted time lapse and some of the photos below. This campsite is nice, but not great as it has no decent swimming area – though for $15 you can’t complain! The wind at this campsite was fierce and threatened to blow over our tents. Jon compared it to, ‘bivouacking on the north face of Everest’, and when we awoke this morning the wind was so brutal we were unable to start the fire for coffee so we moved on to Richmond, Washington for breakfast. God Bless America (and the VW). Majestic hills along the Columbia River by Priest Rapids..
Spartan campsites but nice views at Priest Rapids. Night time at Priest Rapids.